New from the Royal Canadian Mint is the 2013 Bald Eagle 1/25 Ounce Gold Coin, the 12th issue under the Mint’s series of 99.99% pure, 1/25 ounce gold coins. Struck in a collectible proof finish and limited to a mintage of 10,000, the gold coin is available directly from the Mint’s website (mint.ca) for $129.95 CAD (~US $126.53). Featured on the coin’s reverse is a profile portrait of a Bald Eagle, a majestic bird of prey found in Canada and the United States. Bald Eagles are known for their large size, wide wingspan, distinctive coloring, piercing vision (four times sharper than humans) and huge nests. The Bald Eagle is also America’s national bird, depicted on the Great Seal of the United States. 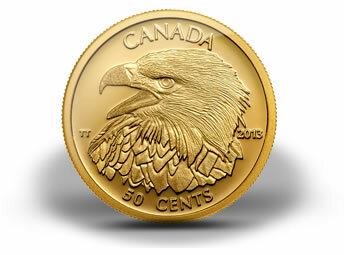 The portrait on the 2013 Bald Eagle 1/25 Ounce Gold Coin was designed by Canadian artist Trevor Tenant. "Its sharp hooked beak is open while its small, far-seeing left eye glares authoritatively at the viewer," describes the Royal Canadian Mint website. "The varied textures and tones of the eagle’s feathers are captured through expert engraving and finishing." Surrounding the powerful bird are inscriptions of ‘CANADA,’ the year ‘2013,’ the coin’s face value of ’50 CENTS’ and ‘TT’ for Tenant’s initials. Each gold coin weighs 1.27 grams, has a diameter of 13.92 mm and a serrated edge. With the current spot price of gold at US $1,576.50 an ounce, the proof coin has a melt value of about US $63. Coins are encapsulated, placed within a Royal Canadian Mint clamshell case and come with a serialized certificate. 1/25th of an ounce???? Give me a break! How big is this coin going to be, the size of a baby aspirin? Ø 13.92mm = Ø9/16″ inch. I’m guessing a 3 cent piece USD george. Collectors suffer in silver and gold, whether it is one ounce proofs for $100 and above from Canada and the Perth Mint, or 1/2 oz coins from European mints. 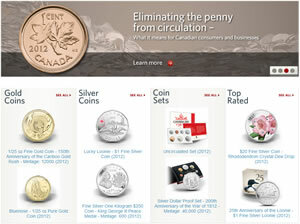 There are plenty of fine one oz coins at reasonable premiums to spot, in silver and gold. A “serrated” edge? Can it be used as a knife, LOL? You see? Even Canada can come out with poor designs too. Be careful when asking for more US coin issues. 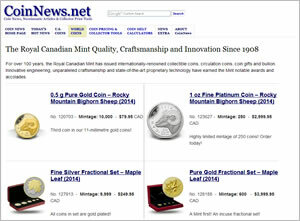 The Royal Canadian Mint has flooded the market with their coin issues. Many never even come close to selling out. The US mint has much fewer selections and this may not be a bad thing for collectors. I am not down on the RCM. I am member of the RCM Master’s Club. Just the fact that too many issues bring down the collectability values. Several other countries issue 1/20th and 1/25th Oz gold coins. They are very small.